Any questions? (+34) 96 671 72 36We'd love to help you! We not only insert Titan implants, but also increasingly metal free, all ceramic implants, which are considerably more aesthetic and better tolerated (biocompatible) by the gum (gingival) than conventional implants. Our dentist and his German Head of laboratory are specialised in high-quality prosthetics and dentures. Implant-supported ceramic crowns, ceramic bridges, partial or full dentures are manufactured and inserted under highest quality and aesthetic standards. The combination of above advantages in our dental practice is unparalleled in Spain. We guarantee high-quality results in both medical and aesthetical terms. Considering the affordable prices, this combination makes us possibly unique in Europe. Dental implants replace the tooth root of missing teeth and are inserted (implanted) into the jawbone instead of the former tooth root. This procedure usually is performed ambulant under local anaesthesia. It takes about 2-6 months for the dental implant to heal and before a dental crown or bridge can be placed onto the implant. In some cases the crown or bridge can even be placed immediatley onto the implant which significantly reduces the healing period. We are happy to check if this is possible in your case. Missing of a single tooth – closing the teeth gap in order to avoid deformation of the jawbone and misalignment of surrounding teeth as well as for aesthetic reasons in the front teeth area. Missing of several teeth in a row – as an abutment for a dental bridge. Missing of back teeth – as an abutment for a dental bridge or a partial denture. Toothless jaw – a row of implants in order to anchor fixed dentures. 1. A tooth gap before insertion of an alll-ceramic implant. and the dental prosthesis (crown). 3. Finally, a Zircon crown will be placed onto the all-ceramic implant. With Prof. Dr. Alvaro Farnós Visedo (Loma Linda University, CA, USA) we have one of the most renowned implantologists in Spain in our team, who teaches at the University Rey Juan Carlos in Madrid, Spain. He does not only insert around one thousand dental implants a year, but also shows other dentists how it is done correctly and most importantly he passes on his knowledge how to achieve a perfect result even in the most complex cases. His extraordinary expertise enriches our dental practice and ensures that our patients receive only the most professionally inserted, aesthetical and perfectly functional dental implants. An exciting field within implantology is 3D-implantology (computer-guided implantology). In complex cases we work with CT imaging (Computed Tomography). With these 3D images it is possible to see vulnerable neighbouring tooth structures (such as the maxillary sinus, the nerve in the lower jaw or possible bone loss) much clearer than with two-dimensional pictures. With the help of the special 3D-Software "Sim Plant" we are able to exactly plan the optimal position for each dental implant by considering the bone structure, vulnerable neighbouring structures and the final position of the dentures or prosthesis. Next, the company Materialise Dental in Belgium produces a template according to our digital planning. This drilling template assures the accurate positioning of the dental implants, exactly where it has been planned. This guarantees 100% accuracy. The dental surgery practically happens on the computer. Thus, implantology is much safer, more predictable and considerably less traumatic. In many cases the use of a scalpel can be avoided and where it can't, only very small interventions are necessary compared to conventional methods. This also means that the dental implant surgery takes less time as without a drilling template. For example, the insertion of 8 dental implants can now be done in only 30 to 60 minutes. software defines the optimal position of each implant. implantologist, 3 surgical drilling templates will be manufactured. Our all-ceramic dental implants are absolutely metal free and highly resistant to acids and bases and therefore offer an excellent alternative to Titan implants. Ceramic implants are biocompatible and behave biologically neutral. This means that the compatibility with bone and gum tissue is excellent and therefore does not cause allergic or foreign particle reactions. In the area of the front teeth the jawbone is often very thin. With conventional Titan implants it can happen that the metal framework shines through. With all-ceramic dental implants no dark shadows shining through the gum can be seen. The dental prosthesis on top of the implant (for example a crown) looks better: A natural tooth is translucent to a certain degree. A Titan implant impedes this translucence. With an all-ceramic implant however, the light can shine through the teeth. Thus, the combination of an all-ceramic implant and a porcelain crown can hardly be distinguished from a natural tooth. 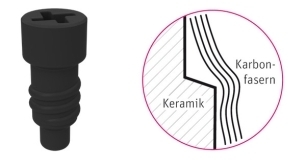 The all-ceramic dental implant system by ZERAMEX heals securely and sustainably. The especially developed surface structure of the dental implants ensures a secure bond between the living bone tissue and the implant, the jawbone fibres will coalesce with the implant. Therefore, the dental implant very soon will be part of your own body. This ensures a perfect osseointegration (osseo = bone). All-ceramic implants are neither magnetic nor radioactive and have a low thermal conductivity. Hence, it is virtually impossible that they interfere in any way with the body. The full ceramic implants we are subjected to strict quality control and have been tested for 100% stability. This reduces the risk of breaking considerably and guarantees a lasting high chewing pressure of the implant for up to a lifetime (provided a good oral hygiene is kept). The all-ceramic implants from ZERAMEX allow us to find the right solution for nearly every patient. Our Head of Dental Planet is personally in charge of diagnosis, consultation and planning of treatments. His experience and specialisation in implant-supported prostheses (crowns, bridges) and his expertise in partial and full dentures contributes significantly to the high quality and highest aesthetical standards. He himself attends to every patient and discusses every case in detail with the German head of laboratory. Considering all mentioned advantages one could think that the costs of our implants must be very high. On the contrary – our prices for comparable quality are up to 75% lower than the prices a good implantologist would ask for in Germany or Great Britain. Do you have any further questions? Contact us, we are happy to help. You can call us on: (+34) 96 671 72 36, or send us an email.